Quality teaching matters - particularly for low-income, inner-city students who perform below grade level. But these students are often taught by the least-qualified and least-experienced teachers. Philadelphia schools will not be able to improve student performance dramatically without more teachers who have the skills, experience, and rich content knowledge needed to help every student achieve high standards. 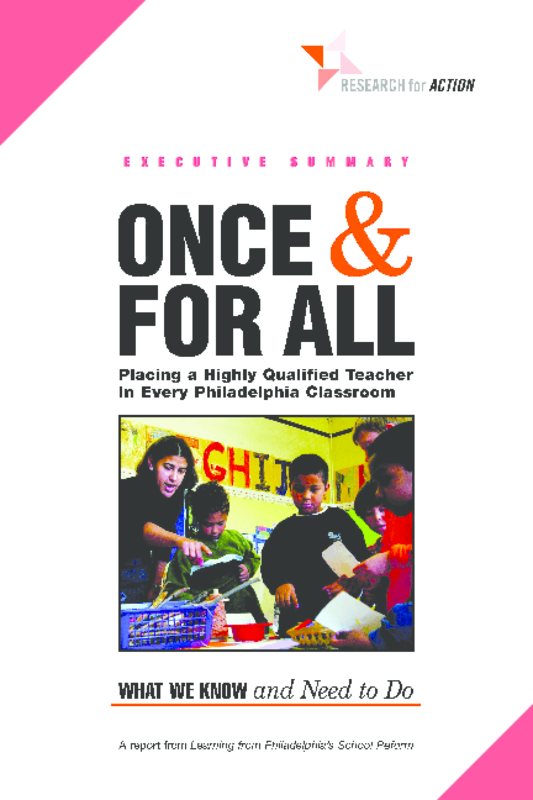 Once & For All: Placing a Highly Qualified Teacher in Every Philadelphia Classroom examines the current status of teacher quality in the city and what the School District of Philadelphia is now doing to ensure that all classrooms have highly trained, motivated, and knowledgeable teachers ready to boost the achievement of the district's 188,000 students. For the first time, thanks to information provided by the School District of Philadelphia, researchers have been able to identify what we know about the qualifications, experience, and school assignment patterns of Philadelphia's 11,700-member teaching force. The study was conducted by a group of scholars who have launched Learning from Philadelphia's School Reform, a three-year research project designed to measure and help the public understand the impact of the 2001 state takeover of the Philadelphia schools, the school management partnerships undertaken with external for-profit and non-profit organizations, and the reforms initiated by the state and city-appointed School Reform Commission (SRC) members and School District of Philadelphia CEO Paul Vallas. Copyright 2003 Philadelphia Education Fund, Research for Action.